Uche Ekwunife, former Senator representing Anambra Central Senatorial District before her election was annulled by a court, has said that she decided to take a walk from the Peoples’ Democratic Party (PDP) to the All Progressives Congress (APC) to actualise her ambition. 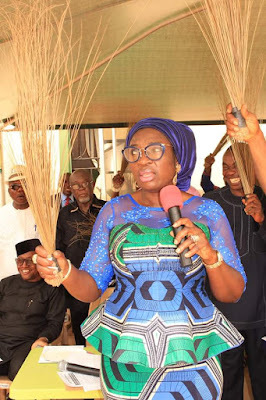 Ekwunife’s defection to the APC flooded the media in the wake of Friday following the decision of her former party, PDP, shifted indefinitely the senatorial primaries in protest over the arrest of the National Publicity Secretary of the party, Olisa Metuh. She added that the decision was important for her since the Independent National Electoral Commission (INEC) said there could not be fresh candidate for the election, shifting the primaries, where she would have been endorsed for the exercise, might affect her candidacy under the PDP. Ekwunife added that she is returning to the Senate to complete her contract with the people in her senatorial district. The Appeal Court sitting in Enugu, the Enugu State capital, had on December 6 ordered the INEC to conduct a fresh election in the district within 90 days. Delivering the judgment, Justice Datijo Yahaya said that the election of Mrs Ekwunife on March 28, 2015, did not meet the prescription of the Electoral Act. Ekwunife had contested alongside the APC candidate, Senator Chris Ngige, who is now the Minister of Labour and may not be vying for the Senatorial seat.